Welcome back to day 3 of this month's Neat and Tangled release week. Today we're showing off a stamp set and dies that work oh-so-well together, both designed by Miriam. Typed Sentiments and the Skinny Strips die set are both must-haves for sure! I love all of the sentiments in Typed Sentiments. There is one that cracks me right up: "no one will ever be as entertained by us as us." haha. I will definitely be reaching for this set again and again. 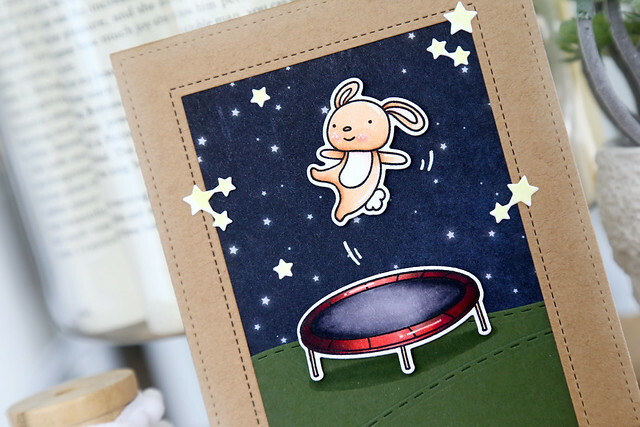 I used it with images from Jump For Joy, and set the trampolining bunny against a night sky. The rolling hills were created using our Stitched Slopes dies. I hope you like it! Before you go, don't forget to leave me a comment. Danielle will choose a winning comment from among the design team's blog posts this week - you could win a $25 gift card to the Neat and Tangled store. And she is running a giveaway for this set today on the blog - check it out! The sentiment strips & dies look fabulous & what a great reason to show is more of yesterday's super cute critters ( that for whatever reason I only got the emails for today as well as day 3) Thank you for sharing. This is a fun stamp set. Love the bunny having a good time. Such a sweet card! Loving the night sky! Your card is darling with that sweet bunny having so much fun! Your sky is awesome. Love the new sets today - SO MANY wonderful sentiments - must have! Super cute card! I love the Typed Sentiments Stamp set and the Skinny Strips dies! 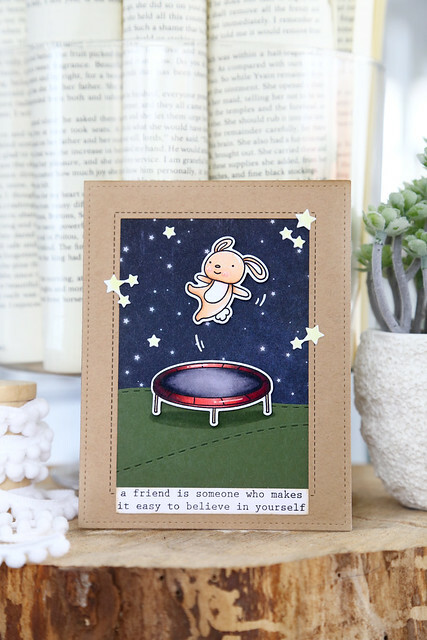 Love that adorable jumping bunny and your night sky too! How fun is this card!! Such an adorable card!!! Your coloring is perfect with the night-time and sweet bunny having fun! What a gorgeous card! I love your joyful bunny and the very appropriate sentiment! Love this cute image and great pairing of the new sentiments. Love the sentiment you chose to go with this cute scene. Oooh, such a fun card! And what a great sentiment! Adorable! Love the sentiment you paired with it too! This so cute! Love so much the stunning background and this sentiment!!! The extra stars--die cuts, are such a great add on, extra special touch! I just love this little scene--he is so HAPPY! This is so adorable!! Your night sky is fabulous! This is darling and the sentiment is perfect! Avery Elle spring release blog hop!